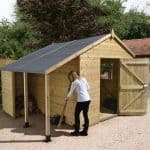 The 10′ x 6′ Shed-Plus Champion Heavy Duty Workshop with Logstore – Single Door is a truly amazing looking shed that has style, strength and an awesome log store located right on the side to give you some bonus storage space. Inside the shed there is a very generous amount of room to make use of, so much that this is a structure which would make for one fantastic workshop or a place to relax as well as somewhere just for storage. While one side of the shed has that very appealing log store, on the other there is two toughened glass windows to let the sun in and as they can both be opened you can let fresh air in here also. 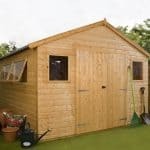 Shed-Plus are very well known for making long lasting and high quality sheds and that is exactly what we have here. 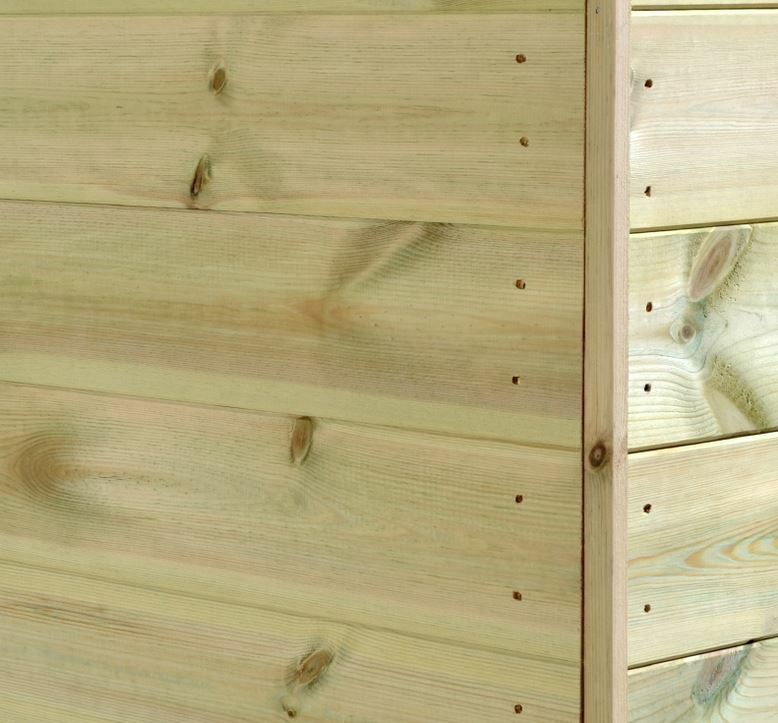 Pressure treated timber is used for the tongue and groove shiplap cladding, the frame and even the floor and roof. This is one very strong shed that is going to give you years and years of service and of course as well as being very practical it is also one of the most interesting looking sheds on the market right now thanks to that lovely log store on the side. This is the type of shed a person who is looking for something that is not just a wooden box to store things, but is something that is a little bit more on the stylish side would buy. 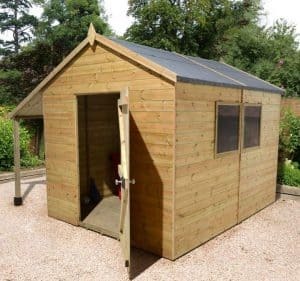 The 10′ x 6′ Shed-Plus Champion Heavy Duty Workshop with Logstore – Single Door as you can see from that first picture is just a lovely looking shed. As well as being nice looking, the room inside the shed is quite impressive as the width is 10 feet and the depth 6, which we feel is a very generous amount of room to make use. One thing the picture does not do justice is the height of the shed. At the highest point it is 8 feet 4 inches and the lowest part which is the eaves is 6 feet 5 inches. When talking about the storage space the shed gives you we of course have to mention that amazing log store on the side of the shed. This gives you an extra 3 feet of room and we just absolutely love this. It of course looks great, but it also does give you a little bit more space to use. Part of the log store is open to the elements, but at the back there is some protection from the weather. The only thing we wish this log store had was a floor, but as it is, we do still really like it. The roof has a very unique look to it thanks to the log store. While this is an apex roof it slopes far more to one side which gives it a style that is not like anything else we have seen. Covered with roofing felt and made with impressive boards that have been pressure treated, the roof is high quality from the top all the way to the slope hanging over the log store. 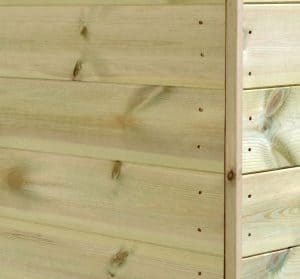 While your eyes at first will be drawn to the high peak of the apex roof or to the log store, after a short while, we are sure you will notice just how much charm the tongue and groove shiplap cladding this shed has. At 12 mm thick, Shed-Plus have made sure that there is not little slots, grooves or areas that water can make its way into the shed. The frame inside here is made with pressure treated timber just like the rest of the shed, but for a frame, being pressure treated is actually a very big deal as it makes this just so much more secure. At 34 mm x 34 mm this frame is a very impressive size and with that size comes a lot of strength to ensure this shed stays firm and does not start to get flimsy after a couple of years. We are actually very confident that this frame will still be just as secure 20 years from now. 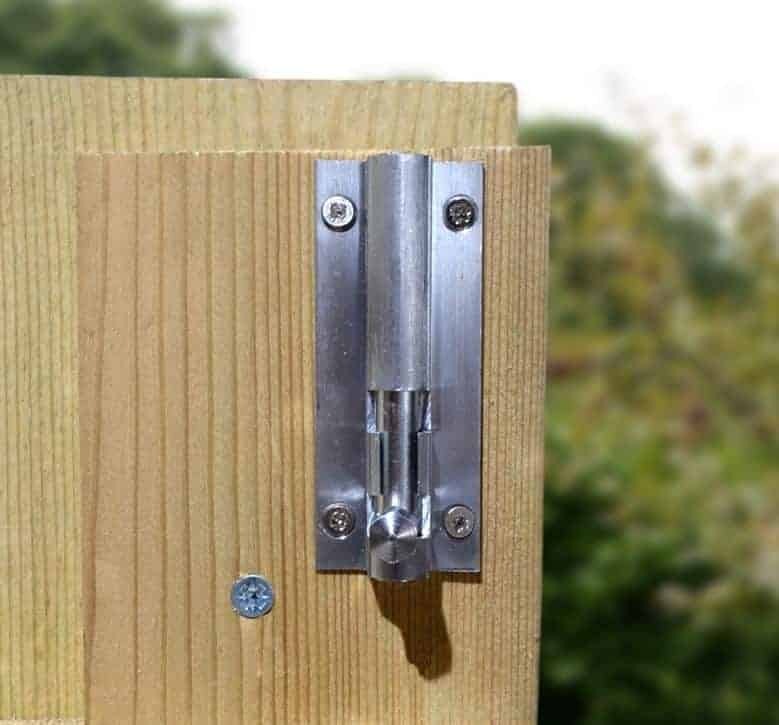 While what the log store has is not what you would call a frame it does have some very heavy duty supports and it also has some tongue and groove cladding on there as well so it is just as strong as the rest of the shed. If you look closely at the pictures you can see the very classy looking floor that is inside. It is made with tongue and groove boards and as it is pressure treated, you are going to be able to put many heavy things inside here. Shed-Plus have clearly gone for a floor that is not only practical, but is also something that fits in with the style of the rest of the shed. The pressure treatment that all the timber goes through is rather intense and it makes the wood strong right from the get go. Shed-Plus pressure treat all of their sheds and it is one of the reasons as to why they are held in such high esteem. While the pressure treatment is fantastic, we still would suggest that a coating of wood treatment should be applied to the wood so that it keeps its smooth look for many years. Shed-Plus give you one of the best warranties of any shed manufacturer. They give you one that lasts for 15 years. The reason they are able to do this and they feel comfortable doing so is because of their pressure treatment process. We know that the door looks very large in the pictures, but incredibly this is only a single door. A good sized single door we might add as it is, 2 feet 11 inches wide which is a few inches more than a regular single sized door. The height is 5 feet 11 inches which again just like the width is a couple inches more than what you would expect with a single door. 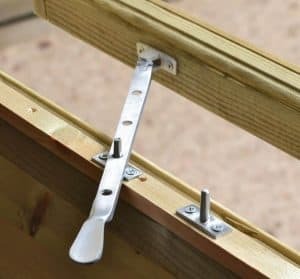 The hinges that are used on this door are very robust and will not allow the door in any way to sag. On one side of the shed there are two windows, we really like the look of these windows and they also can open so as well as letting in natural light they also can make sure plenty of fresh air is getting into the shed. In keeping with the high end nature of the rest of the shed, the windows are made with toughened glass which has a striking look as well as being able to take the occasion hit from when the kids are throwing things around the garden. The 10′ x 6′ Shed-Plus Champion Heavy Duty Workshop with Logstore – Single Door does offer you lots of security. So this makes it something that would be ideal for items which are more expensive. 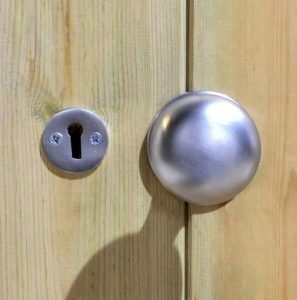 As you can see the door comes with a lock and key which will keep people out and else ensure the door stays firmly closed. Talking about privacy is kind of odd with this shed as on one hand the actual shed does offer quite a bit of privacy, especially if you have the two windows facing away from where nosey people can look. The log store though does not offer any kind of privacy as it is wide open so you would not want to put expensive things in here. The pressure treated timber apart from being able to be coloured does not really allow for much customisation. We do not see this as a negative though as the shed looks absolutely gorgeous the way it is. There are a few extras for you to think about starting with their installation service which costs £109, which is not too expensive to be honest. Another extra that is on offer is a workbench which is made in a style to match the shed. This costs, £106.99 and is something to think about if you are going to use this as a workshop. The last thing they offer is the most spectacular and also the most expensive which is a slate roof. This covers the whole roof including the log store and it costs a very expensive, £349.99. 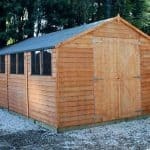 The pressure treatment which the timber goes through makes this a very high quality shed, but as well as that it just has a look that lets you know right away, you have a very high quality shed. The pressure treated timber when given a coating of wood treatment is going to look fantastic for many years. 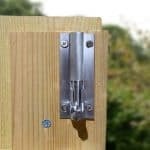 We love how Shed-Plus have made this a structure that is going to be around for 20 or more years and do so with very little effort required on your part. 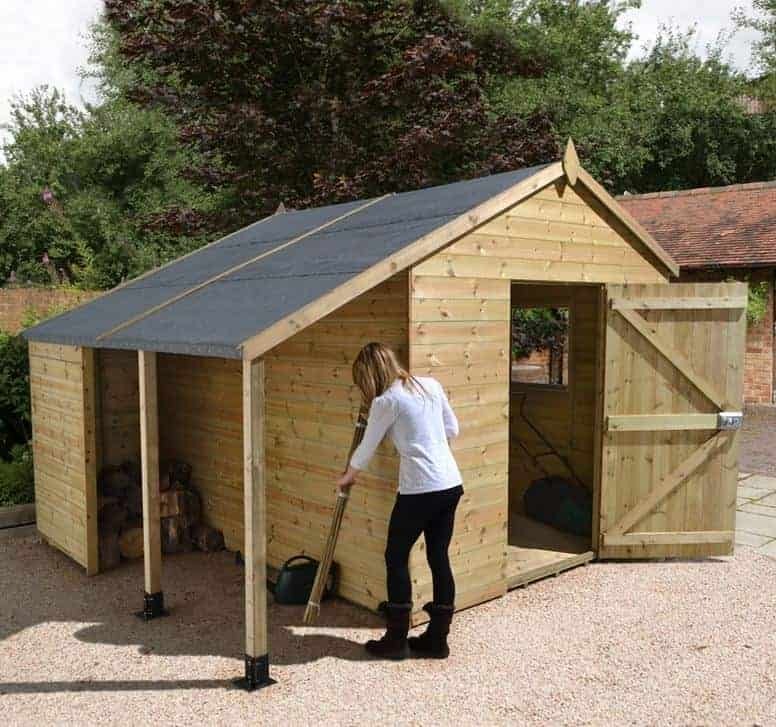 The 10 x 6 which is offered by the shed is already what we would class as a good amount of storage space, but when you add in the extra 3 feet the log store gives you then you really do have some serious room to make use of. As is the case with any shed of this size, taking your time, following the instructions and taking a tea break when you get stressed will see you have this installed in no time. We really wish we could score this a half point higher, but it is very close to being £900 and despite being a great looking shed, we do know that is a lot of money. Still if you can afford it or save up for it then we do think you will be very happy with it. 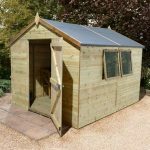 Final Thoughts: We feel that the 10' x 6' Shed-Plus Champion Heavy Duty Workshop with Logstore - Single Door has a style which pretty much everyone is going to love. Of course if you love it enough to pay the asking price is a totally different question. 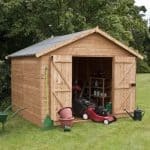 While the price may seem high, we must tell you that this is one very well made shed that uses the finest materials, has a great design and if looked after in the right way, could actually last you many decades. If you have the budget for this shed then we say go for it as we are sure you will not be disappointed with it and it looks even better in person than it does in pictures.